Goobi 2.1 came with a redesigned GUI that is not only more user-friendly and up-to-date but also featured a host of new functions. Many of these were located in roughly the same place and were based on the same operating principles. This meant that users could familiarise themselves very quickly with the new version. Users can display the new inline help function at any time to deal with questions that might arise when using Goobi. To ensure full reverse compatibility with earlier Goobi user scenarios, version 2.1 included an option to switch at any time between the new and old GUI. This function was designed to help users move smoothly to the new interface and compare it whenever necessary with the old design dating back to 2005. 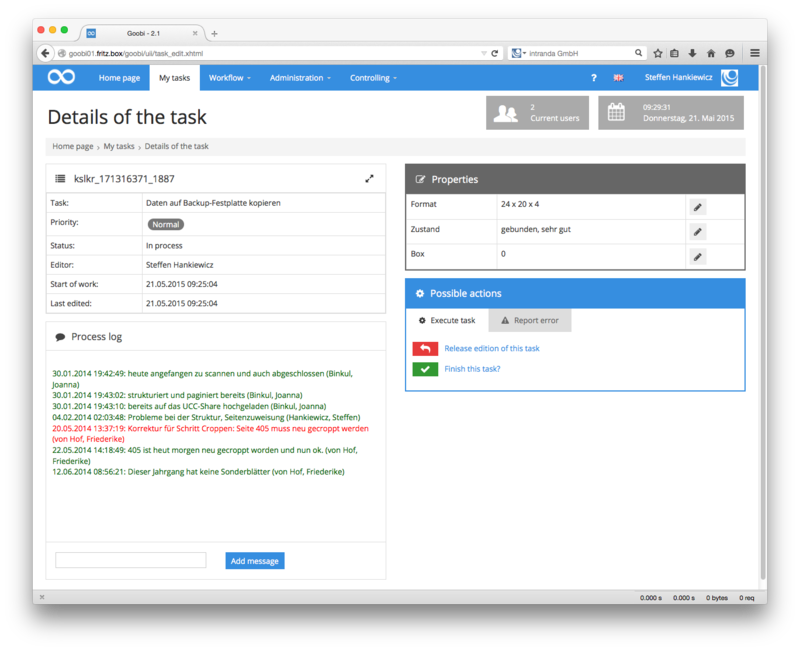 The allocation of users and user groups to specific tasks within the Goobi workflow became much clearer in version 2.1. 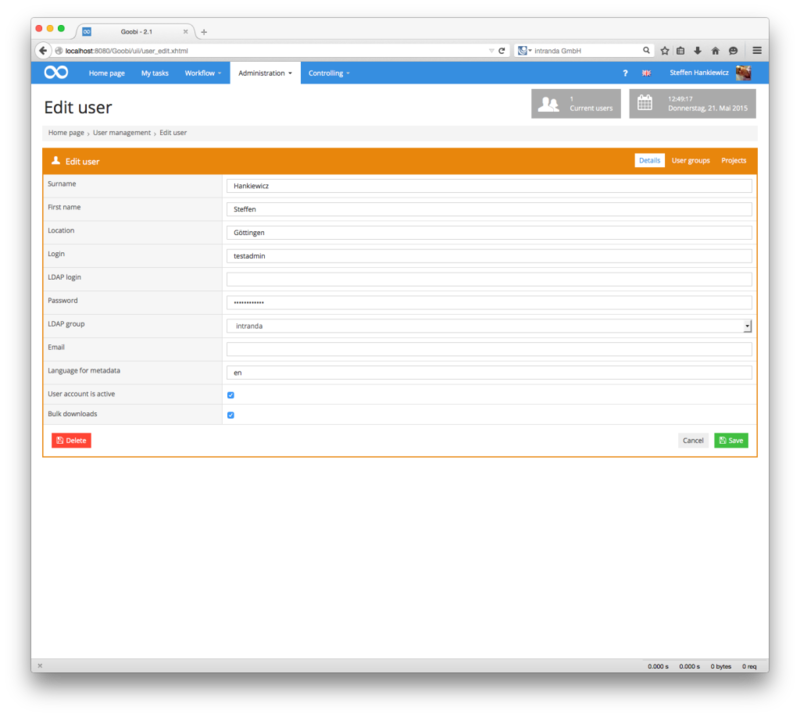 Rather than managing users and user groups individually, they can now be shown in a more compact form that gives a better overview of individually authorised users. Goobi version 2.1 included support for Gravatar as a central user icon display service. The application allows any user to establish a cross-platform gravatar simply by providing an email address. 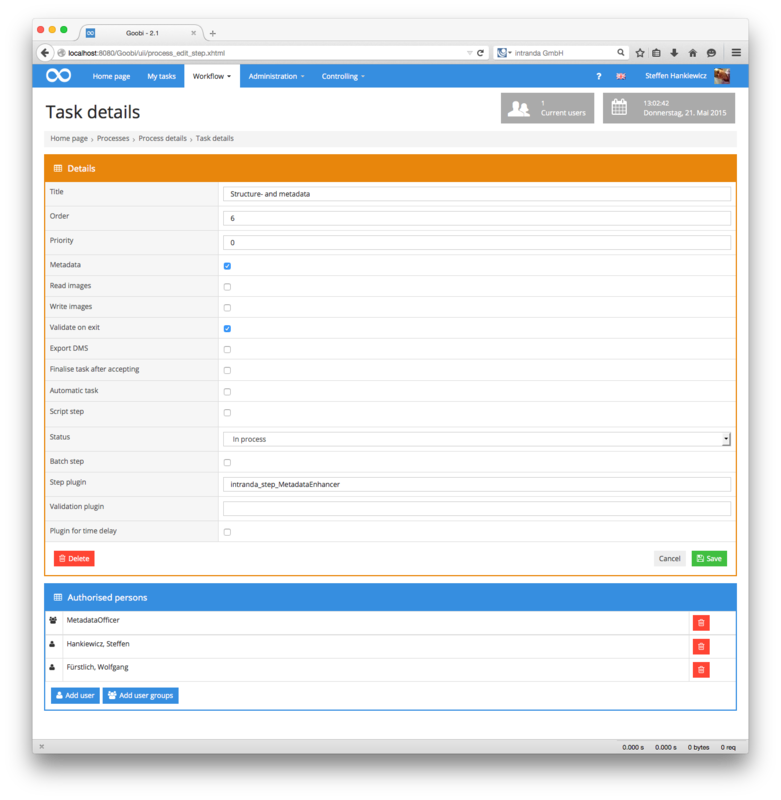 In Goobi, this can be used to display responsibilities or for internal communications. The classic user interface in Goobi version 2.1 was fully compatible with Internet Explorer 11. 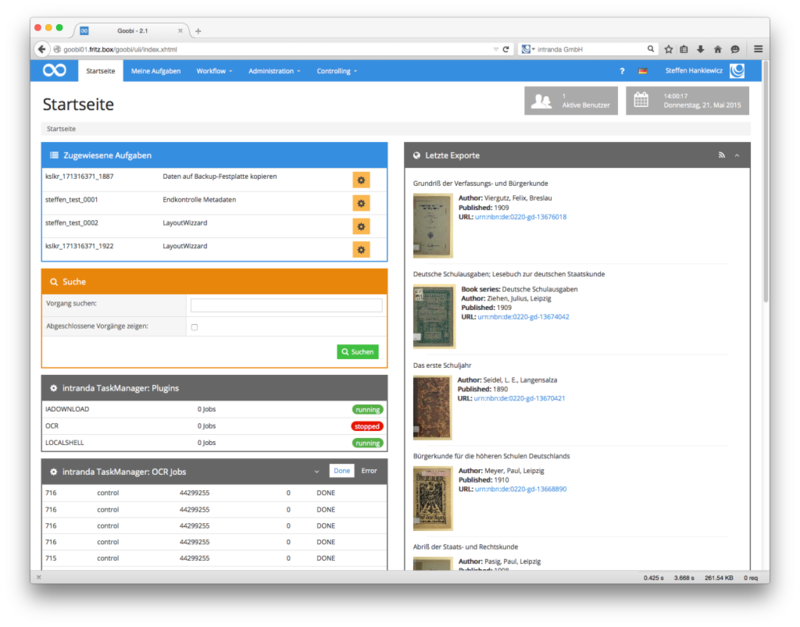 Version 2.0 offered a plugin interface for importing bibliographical data from a catalogue. 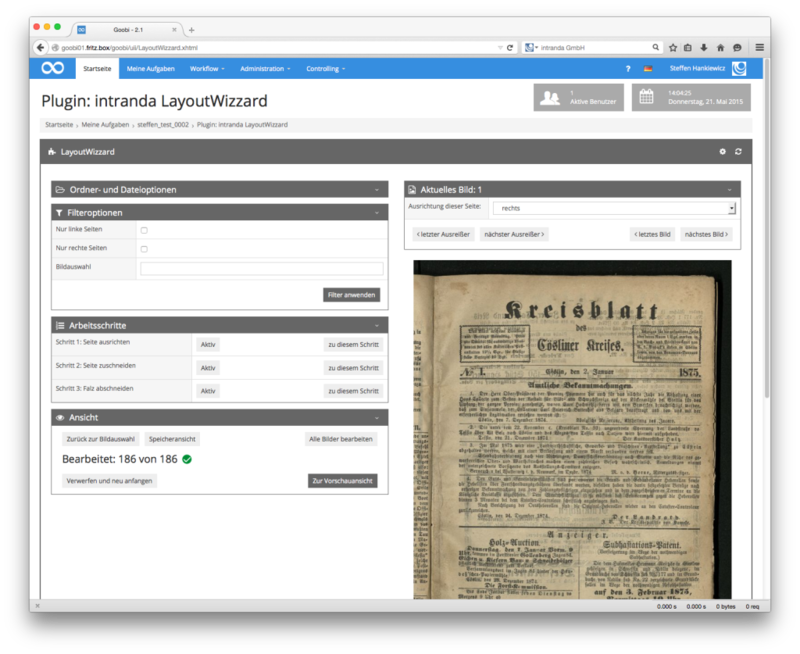 This made it possible to add a range of catalogue types as plugins. 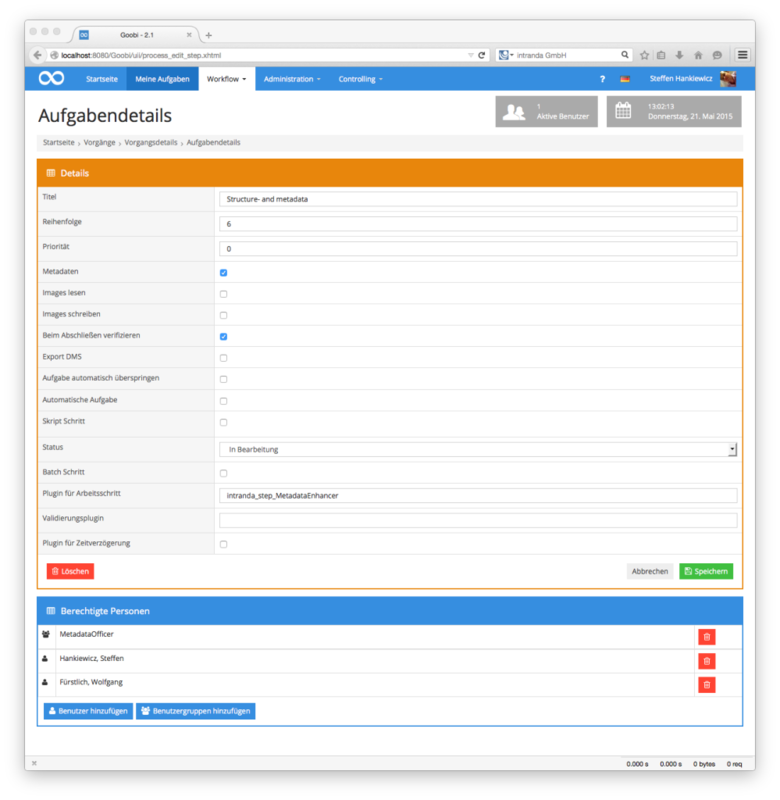 With the advent of version 2.1, the catalogue request field could be configured separately for each project. For each project, it is now possible to specify a different field (e.g. barcode) as the default when importing. 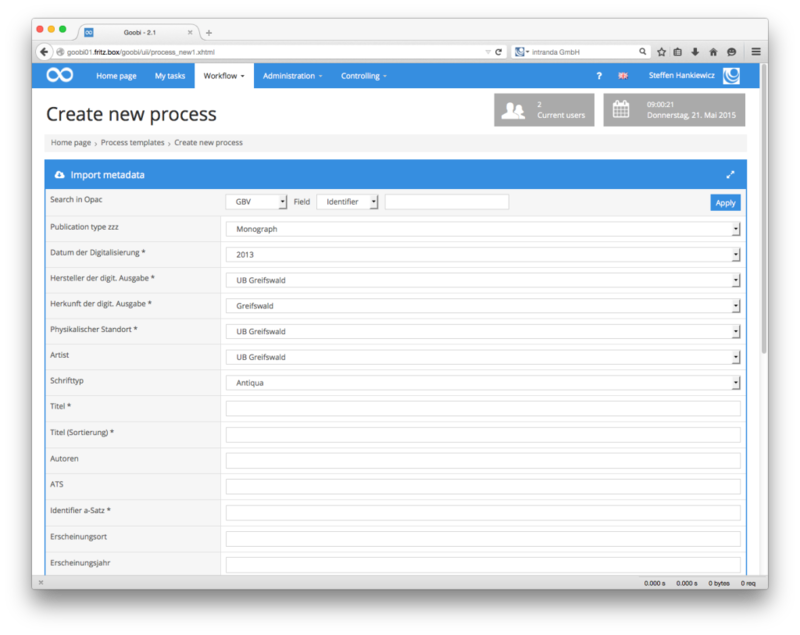 As well as the selection lists included in previous versions, the ‘Create new process’ box in version 2.1 allowed users to define drop-down lists. By contrast with the selection lists, the first item in the drop-down list is pre-selected. When creating new processes in earlier versions of Goobi, all the configured fields were displayed at all times. With version 2.1, they are shown dynamically in response to the selection made by the user. Selection fields for which only one value can be selected and which therefore do not require user interaction are automatically hidden. This typically involves values which have to be defined for registration in portals such as the ZVDD and which are therefore pre-selected. Initially, some other less frequently used fields are also hidden (e.g. TIFF header information), as these are rarely changed manually. These fields can of course be displayed and edited at any time via the user interface. Goobi’s advanced search functionality was again massively overhauled in version 2.1. On top of the changes made in version 2.0, the search dialogue now included options to search the content of METS files and other metadata. In order to make the process of searching information mainly available in XML format as user-friendly as possible, the search form was again revised and made more flexible. At the same time, we made improvements to search indexing. This allows for highly efficient searching, even where the volume of data involved is very large. In version 2.1, the extended search dialogue box came with an option to search within the process log field. This meant that process notes added by users when working can now be located at any time, even if the number of processes involved is very large. In order to give individual users a clearer picture of the overall workflow for the current process, version 2.1 came with an option to display (in My tasks) an overview of the entire workflow showing all completed and outstanding workflow steps. Goobi’s mass download and process allocation functions were significantly improved in version 2.1. The previous time-consuming checking routines in the file system were replaced by a smarter check on the directory analysis. This led to a considerable improvement in terms of speed when many Goobi processes need to be worked on simultaneously, especially when those processes contain a large volume of data. 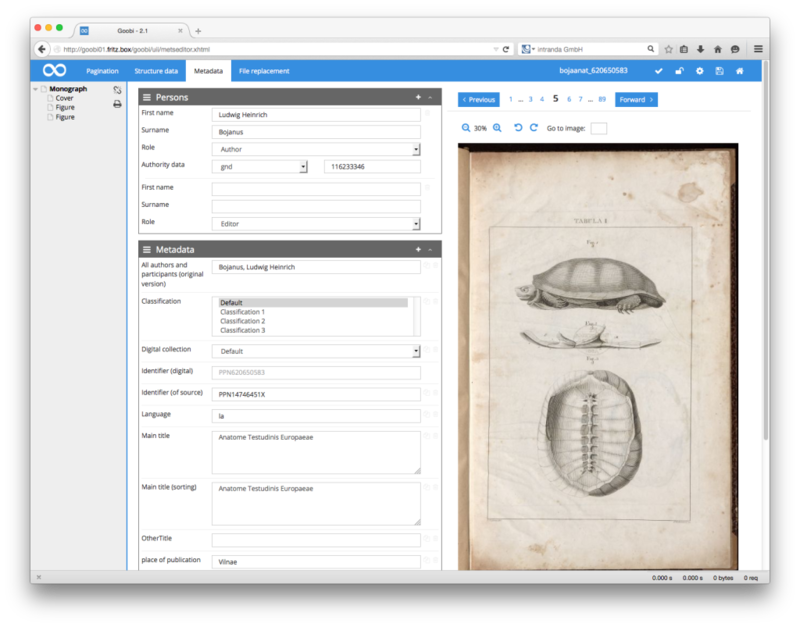 The default method for displaying metadata fields in the Goobi METS Editor was replaced by a more compact and user-friendly view. Rather than the previous default value, unconfigured metadata were shown as a simple input field instead of a text area. As a result, metadata such as language, publishing location and shelf mark are displayed as a one-line input field, thus significantly reducing the need for scrolling. The generally small number of fields that need to be displayed in a bigger format (e.g. main title and description) can of course be configured as a large input field containing several lines. The reading and writing of METS files was revised in version 2.1 to optimise reading performance in the case of very large processes. This was achieved through ruleset caching. As a result, if changes are made to a ruleset while Goobi is running, the application has to be instructed by means of a GoobiScript to read in its rulesets once again. Goobi’s METS Editor can now work with other authority databases in addition to the GND common authority database (Gemeinsame Normdatenbank). This simply involves specifying all the available authority databases in the configuration file goobi_normdata.xml. If this file is missing, only the GND will be available. 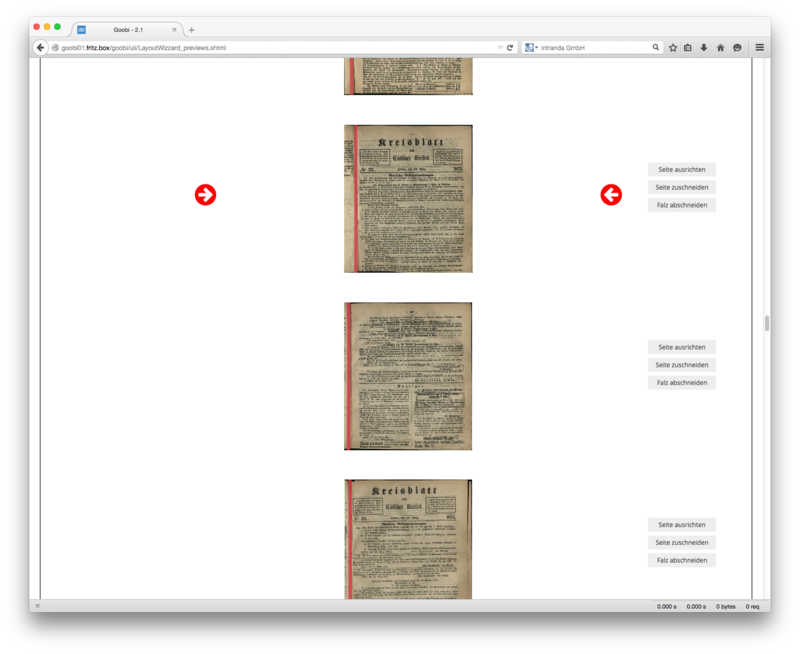 Previous versions of Goobi’s METS Editor had long featured various key combinations to help users navigate between the displayed images. Version 2.1 introduced a new key combination for saving. METS files can now be saved at any point during data input simply by pressing the keys [Control] + [Shift] + [Enter]. One of the biggest changes introduced by Goobi version 2.1 was the option to enter metadata while generating the structure hierarchy. 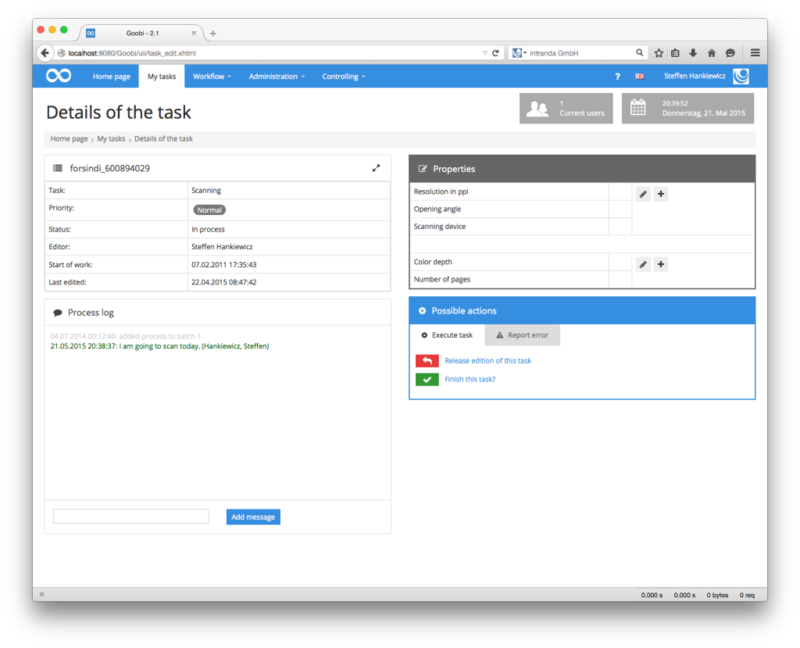 Whereas before it was necessary to first create the structure elements individually and then allocate metadata separately for each structure element, this task is now performed at the same time in a single workflow step within the new input dialogue box. This involves a dynamic procedure whereby all the metadata fields or person types configured in the ruleset as default fields for the selected structure type are displayed as input fields within the user interface when selecting the structure element to be added. For a given chapter, for example, it is possible to allocate an author and a main title immediately, whereas when adding an illustration all that might be required is a description. As the correct image is generally displayed at the same time when recording the structure, metadata can simply be read off from the correct side and entered straight away while recording the data. By specifying in the ruleset the default fields to be displayed in the METS Editor, you can save around 50 percent of your working time for indexing. Version 2.1 introduced one further improvement that makes page allocation for newly generated structure elements more efficient and reduces unnecessary switching between images. As well as an option to allocate the currently displayed image to the structure element being generated, there are two more buttons that allow you to add the preceding or the following image. This means that any pages that were accidentally overlooked can be allocated when searching for the end of a structure element without having to turn back. 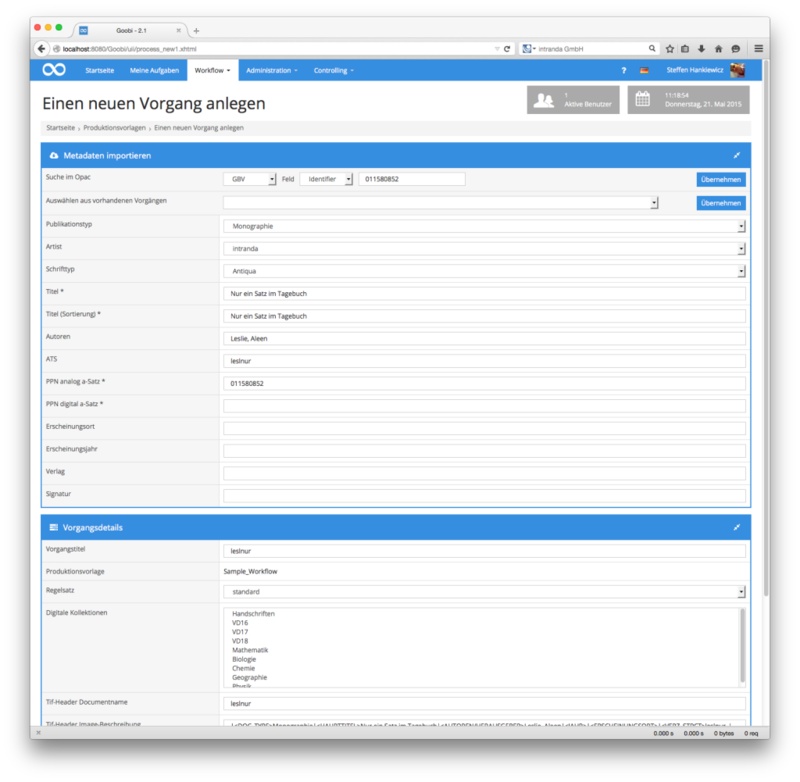 In version 2.1, Ajax technology was introduced in many areas of the METS Editor for communications between the user’s own browser and Goobi as a server application. This means that numerous changes made by users during the editing process can be reported immediately to Goobi so that the application responds even more quickly. With previous versions of Goobi it was possible to edit metadata in the METS Editor only for the logical area within the METS file. Beginning with version 2.1, users can now edit the physical structure hierarchy in the METS file. This means it is now possible, for example, to enter individual metadata for each image file or access and modify information belonging to the ‘BoundBook’ as generally required when saving the shelf mark. 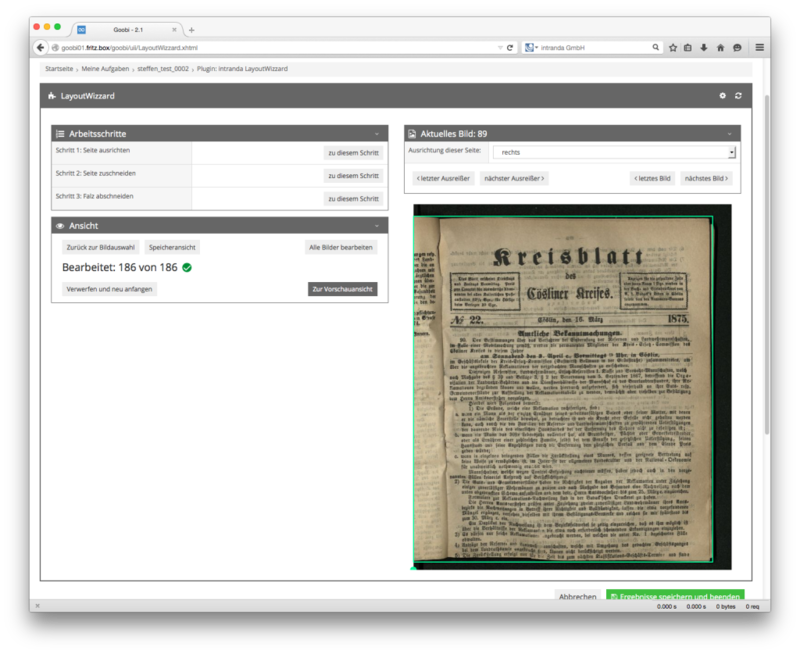 Version 2.1 improved compatibility with other character sets when presenting OCR results in the METS Editor. As a result, Cyrillic and Arabic characters can now be shown in the OCR results. 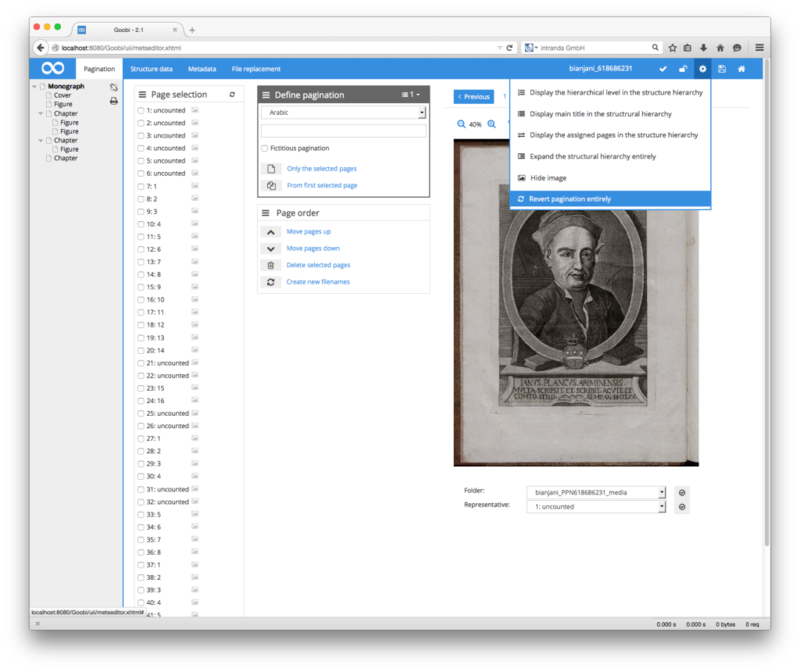 In version 2.1, a new function in the METS Editor allowed users to completely delete an existing pagination and enter a new one based on the file names in the file system. This is advisable in the case of newly added image files in the image directory where those images are to be moved a long way within the order and the order is identifiable using the filenames. In order to simplify pagination, a link is now shown for each page in the pagination entry area. This makes it possible to load and display the selected page immediately, thus allowing users to check individual pages straight away while (or after) entering page numbers in Goobi. Goobi has long been able to generate a wide range of statistical data that help users to present and analyse workflow, throughput and other information in diagrammatic or tabular form. However, Goobi users often want specific functions within the statistics that are not required and therefore not available in every organisation. For this reason, version 2.1 was developed with a new plugin interface that allows individual statistics to be integrated as plugins. By way of example, project-specific information can be shown in the form of statistics that are only really needed by a single Goobi user. Thanks to the latest presentation techniques, it is now possible to draw on a wide variety of statistical formats to display and compare data. Version 2.1 also introduced dedicated support for data exports in Excel or PDF file format from any statistics plugin. In earlier versions of Goobi the start page merely served as a login area. 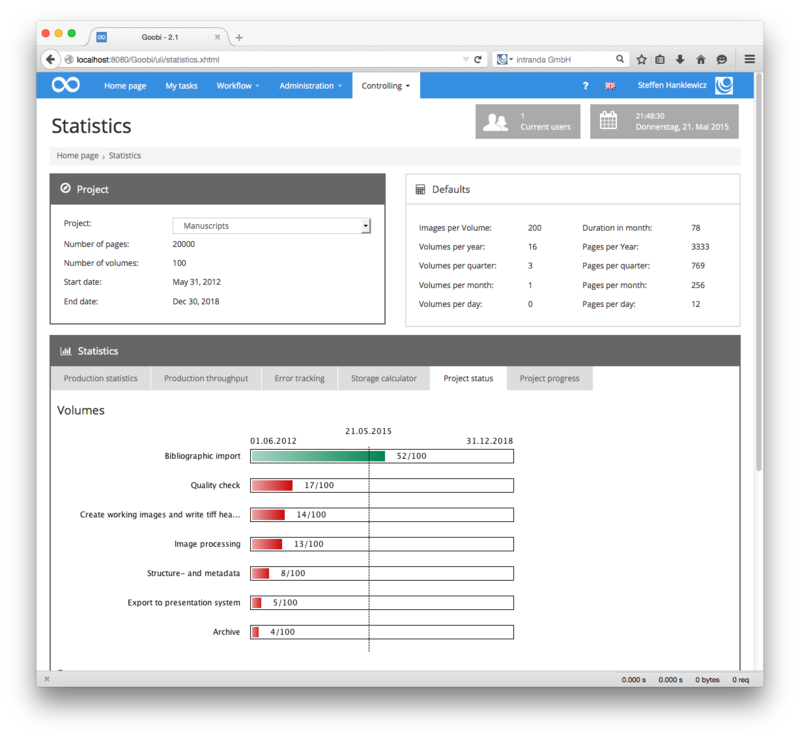 In order to make it more user-friendly and informative while remaining highly flexible, version 2.1 was equipped with a new interface for the dashboard. 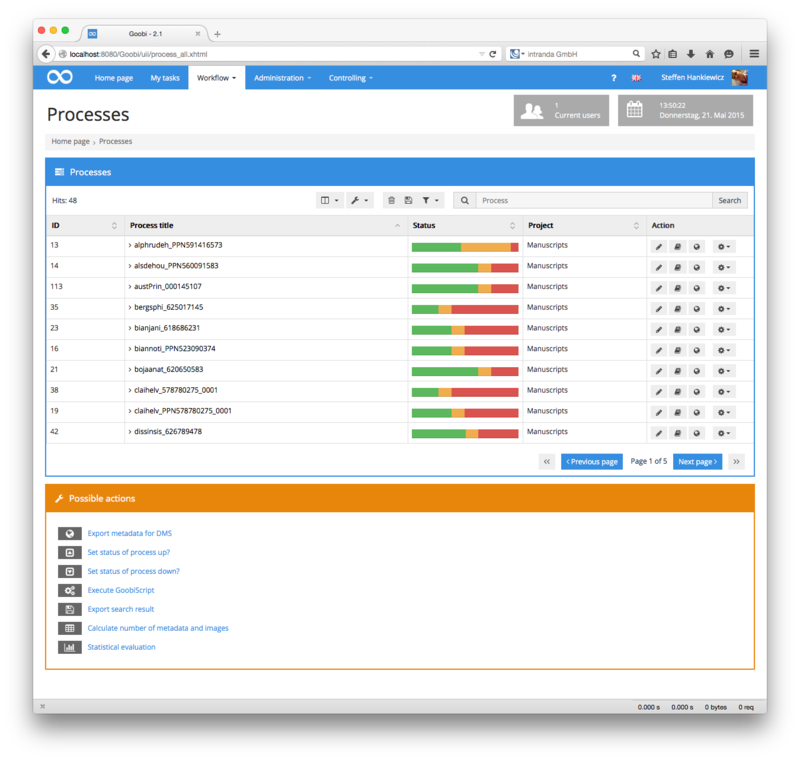 Different organisations can now implement their own dashboard plugins. These might contain information about accepted tasks or the most recent exports to the Goobi viewer. They can also be used to monitor other services and display this status directly. 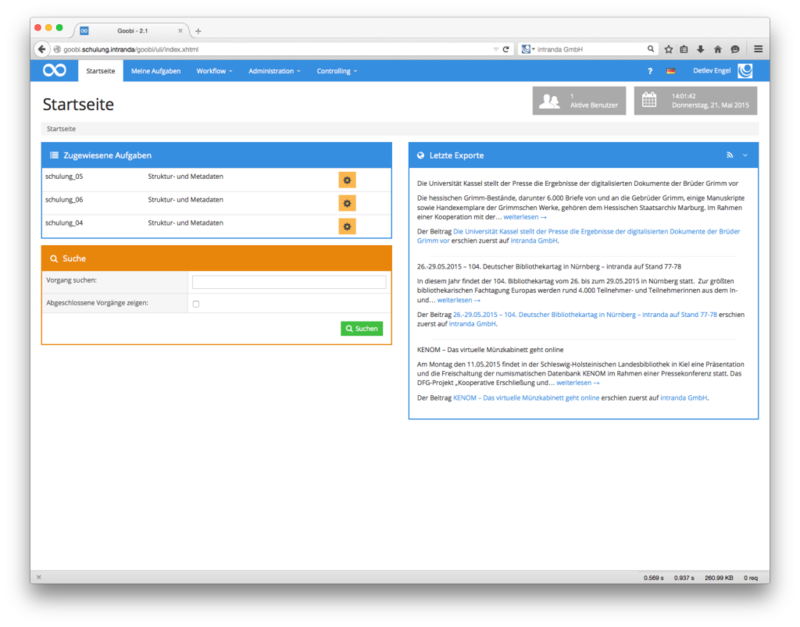 The structure of the start page is determined by the organisation, which can use it, for example, as a way of integrating local information. To simplify the task of controlling image quality, version 2.1 was developed with a plugin that allows users to display images within a workflow step. Using the plugin, it is possible carry out visual checks on images via Goobi’s web interface without the need for access to a network drive. This makes the checking process very straightforward and independent of the network’s firewall settings. 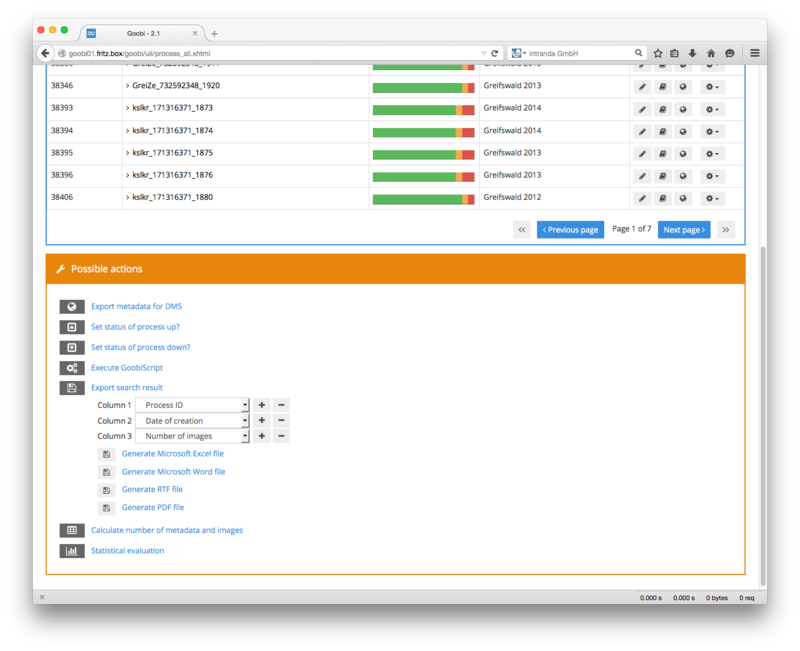 In order to validate image quality, version 2.1 featured new plugins for analysing technical data. 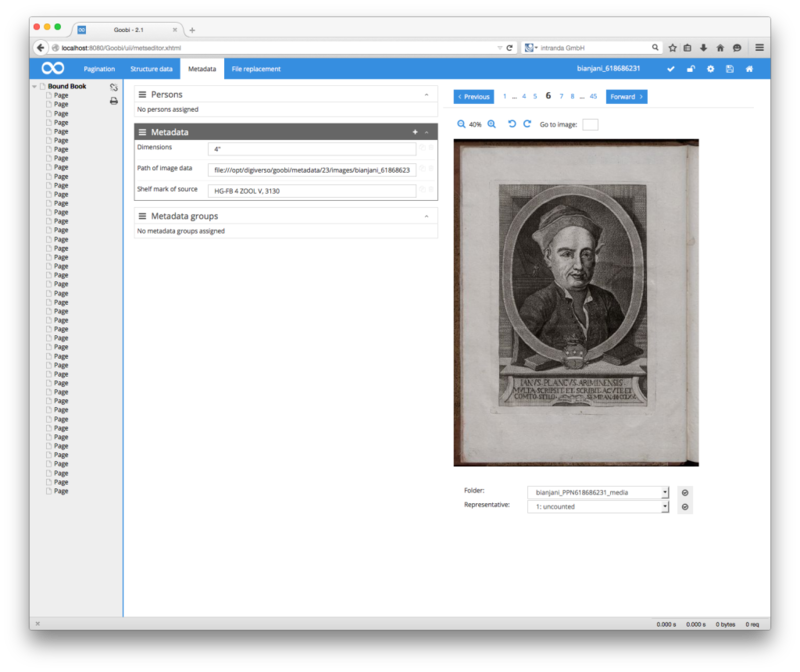 Alongside existing checks to ensure that files are correctly named in accordance with complex regular terms depending on the workflow, the new validation plugins analyse image quality using the application JHove. The validation process can check colour depth, resolution and other technical data automatically within the workflow and send a report to Goobi. 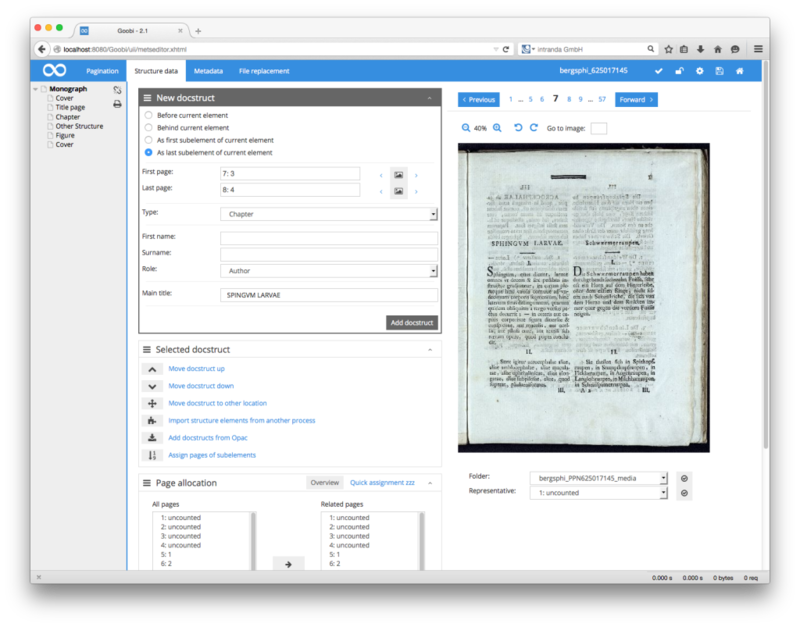 Version 2.1 introduced a series of image optimisation plugins to improve the processing and preparation of digitised material. As well as deskewing and cropping functions, these included new automated book spine detection systems. 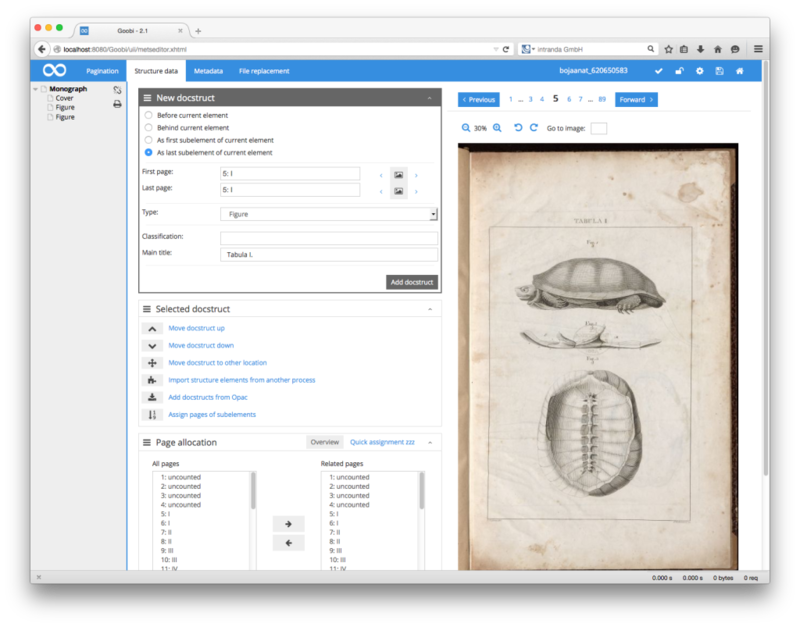 Alongside the master image file, users can now generate compressed derivatives that have been enhanced for online presentations, PDF generation or OCR purposes by fully removing any black edges or central spines. 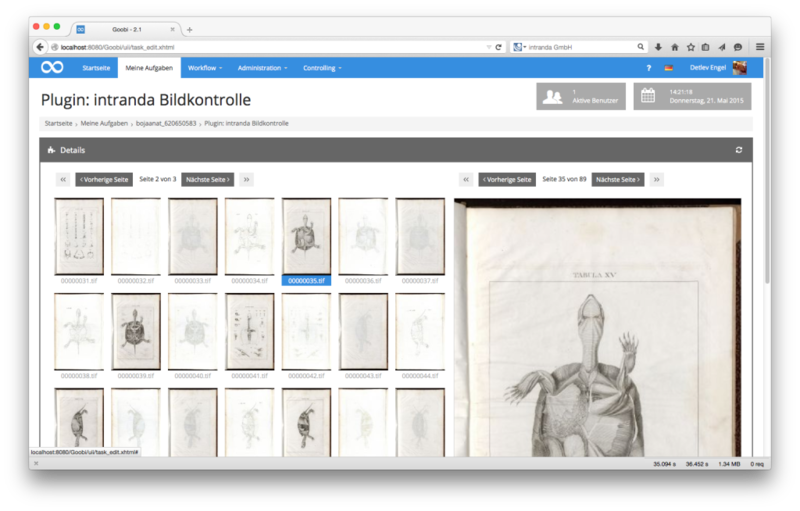 Goobi version 2.1 can import a wide range of authority data when performing a catalogue request. 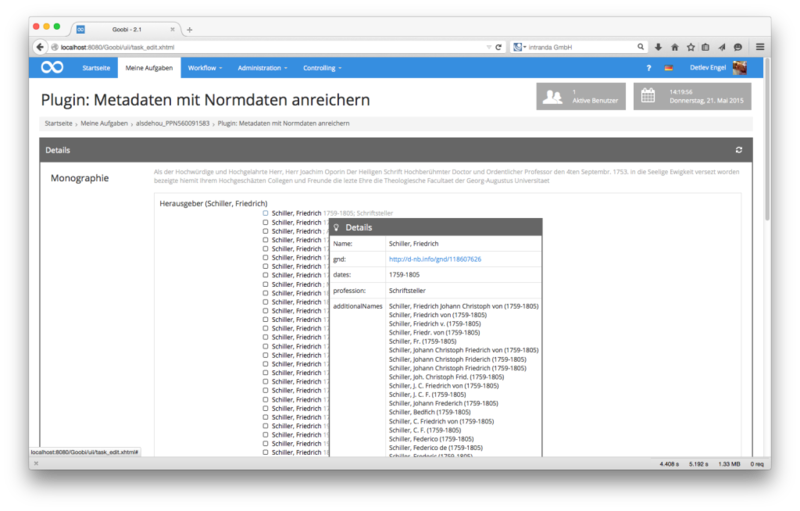 Although the catalogues do not provide information for the allocation of authority data to the structure elements generated during metadata indexing, this can even be done retrospectively for all existing Goobi processes using a plugin designed to enrich the metadata with identifiers from the GND common authority database (Gemeinsame Normdatenbank). Goobi version 2.1 allowed full encryption of communications between the browser and Goobi. This involved correcting information within paths on some images, statistics and icons. Version 2.1 introduced full support for IPv6 in communications between different services and Goobi’s WebAPI. For the first time, Goobi version 2.1 provided full support for communication via a proxy server. Thanks to this implementation, it is now possible to run a proxy server between the user and Goobi or between Goobi and another external application (e.g. a library catalogue or the OCR service) without affecting communication. Version 2.1 corrected a previous calculation error that had generated incorrect figures in the table of production throughput statistics. Version 2.1 allowed all users to store an email address in their user account. This email address can be used, for example, in time-consuming workflow step programs to notify the user when a task has been completed. For some years, previous versions of Goobi allowed users to fine-tune the way metadata are displayed in the METS Editor. 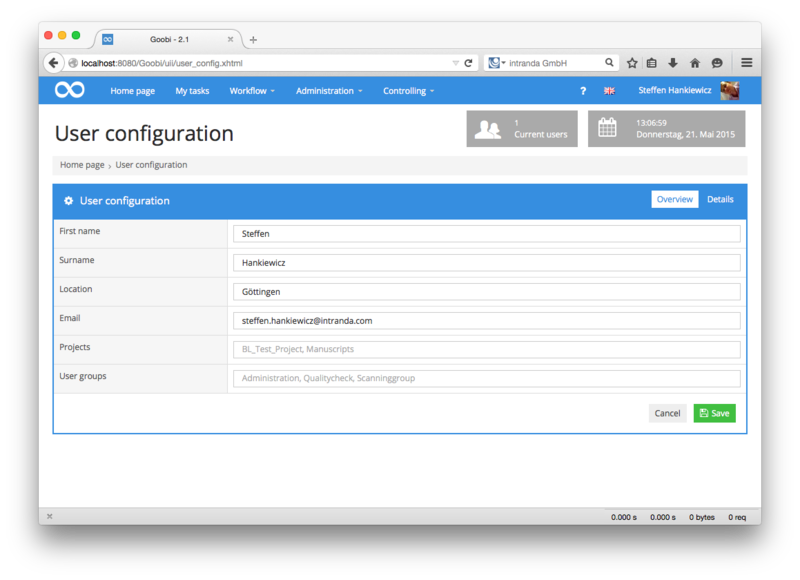 The configuration file in version 2.1 was thoroughly restructured to make this much simpler. 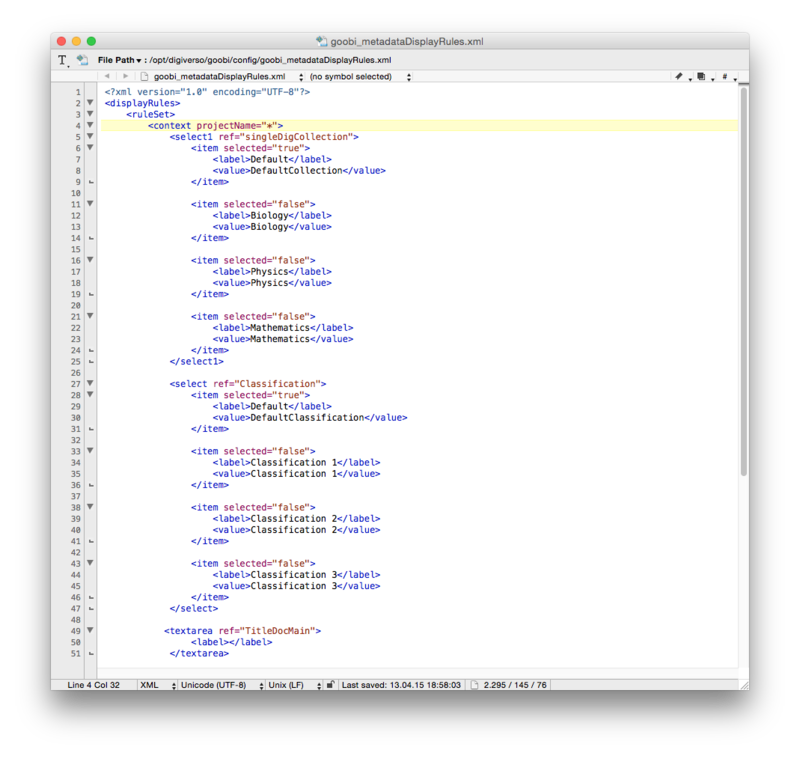 An example of the changes made in the file goobi_metadataDisplayRules.xml is given below. 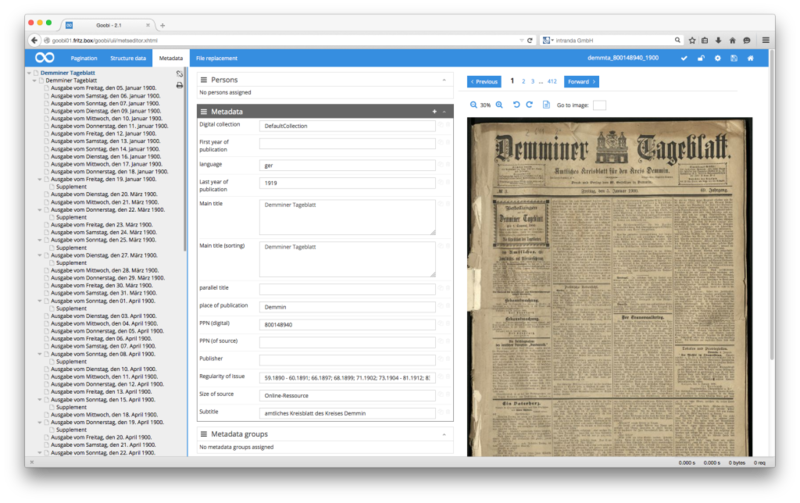 The changes make it much easier to modify the appearance of Goobi’s METS Editor for a large number of projects. Version 2.1 resolved an error created when comparing process properties. The error had previously meant that some properties were not reliably duplicated. 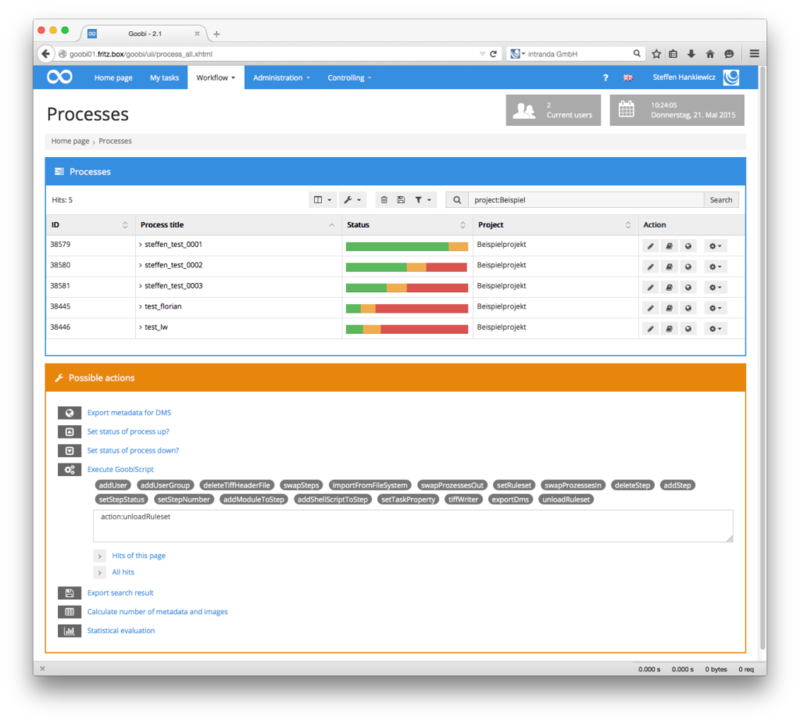 The previous logging framework Log4j was replaced by chronicle. This delivered a massive improvement in performance when logging information. It also provided new options for greatly extended logging and allowed users to help determine what can be done to improve analysis in the event of error. Goobi’s internal translation methods were revised in version 2.1. As a result, it is now possible to use any number of variables within individual blocks of text. The scope of the fully automated unit tests that check the source code and therefore help to maintain product quality and stability was again greatly expanded. For future versions, too, this will ensure there is no loss of the existing functionality already covered by tests.